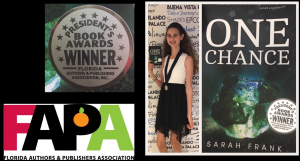 Sarah and One Chance win book award! 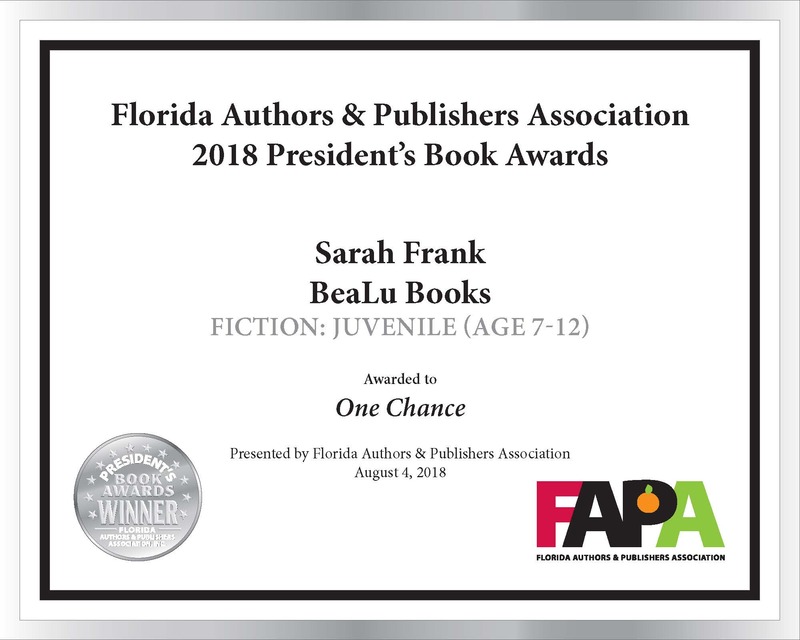 Sarah and One Chance have won their first award: a SILVER MEDAL in Juvenile Fiction, age 7-12 category by the Florida Authors & Publishers Association, Inc.! We attended the FAPA Awards Banquet in Orlando. Thank you to everyone who has supported us through this journey, we are so excited! “Each year, the FAPA President’s Book Awards program recognizes book publishing excellence and creativity in design, content, and production for North American authors and publishers. Librarians, book industry professionals, and educators from Florida and other states will judge content, theme, layout, and cover design elements. For 2018, eligible books could be entered in forty-three categories, with only 2 categories for Juvenile readers Age 7-12. Sarah & One Chance’s Book Award featured on Bay News 9! Sarah was interviewed about her Florida Authors & Publishers BOOK AWARD by Dalia Dangerfield on Bay News 9! You can buy One Chance on Amazon, Barnes & Noble or get a signed copy at the publisher’s site Bealubooks.com In the Tampa Bay area, you buy copies in person and online at Inkwood Books. See more about Sarah’s book award from the Florida Authors & Publisher’s Association. Head back to the Homepage for more news and updates! Filed Under: Awards, Media appearances Tagged With: #OneChanceTheBook, author, Book Awards, Media, On TV! 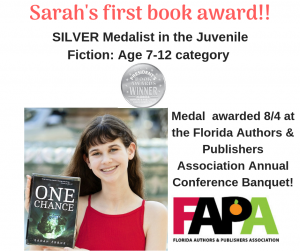 Sarah & One Chance Win Book Award: SILVER MEDAL! Keep up with ONE CHANCE and Sarah and receive updates and "behind the scenes" info about her book, the characters, and the other books in the series! We will even include a book club guide for readers and teachers.